Eide is a municipality in Møre og Romsdal county, Norway. It is part of the region of Nordmøre. It is located on the Romsdal peninsula, along the Kornstadfjorden and the Kvernesfjorden. 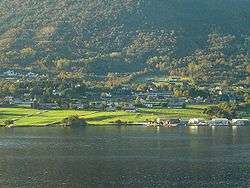 The administrative centre of the municipality is the village of Eide. Other villages include Lyngstad, Vevang, and Visnes. The municipality is known for its traditional and modern limestone (marble) quarries and related crafts industry. The Atlanterhavsveien coastal road connects Eide Municipality to neighboring Averøy Municipality to the east. The municipal border lies at the Storseisundet Bridge on the Atlanterhavsveien road. The municipality of Eide was established on 1 January 1897 when it was separated from Kvernes Municipality. The initial population of the municipality was 1,552. On 1 January 1964, the Vevang area (population: 562) was transferred from Kornstad Municipality to Eide Municipality. On 1 January 1983, the uninhabited island of Eldhusøya (now part of the Atlanterhavsveien) was transferred from Eide to Averøy Municipality.